You can find the most recent information about Webmail in our Helpdesk article. Now every employee can link their mailbox to CRM. The system will collect all inbound and outbound messages no matter whether you work with emails inside CRM or in the mailbox interface. Leads will be created from all incoming emails. 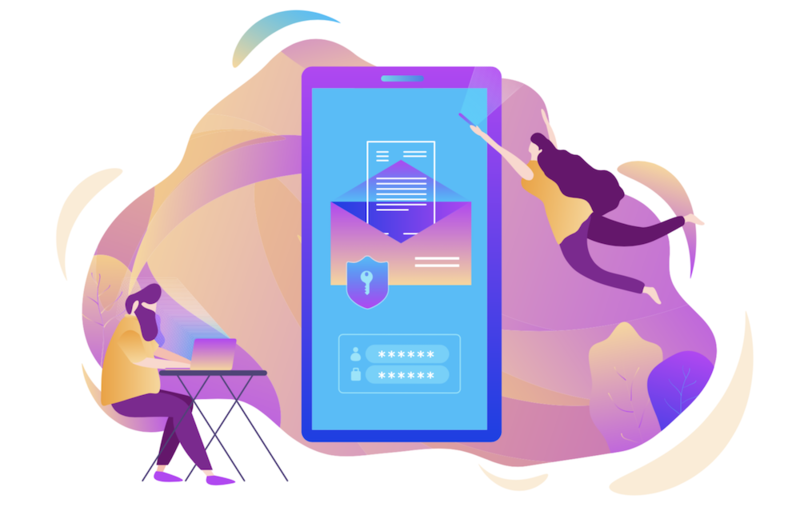 If the message is received from the email address already known by the system, it will be linked as an activity to the proper CRM entity (contacts, companies, leads, deals). Outbound emails will also become activities linked to CRM entities. 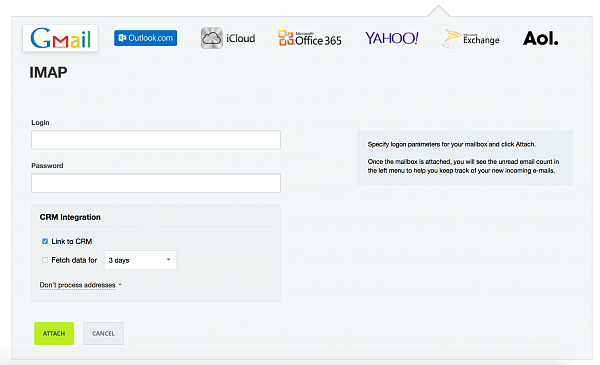 “Link to CRM” will attach your mailbox to CRM. “Fetch data for” will enable you to choose whether the messages from your mailbox will be fetched for the last 3 days or all the time. You can exclude email addresses which you don’t want to process in CRM (for example, work or private emails). Once the mailbox is attached, a special CRM sign in E-mail Services will show the status of your mailbox integration with CRM. If the mailbox is not attached, the sign will be red. 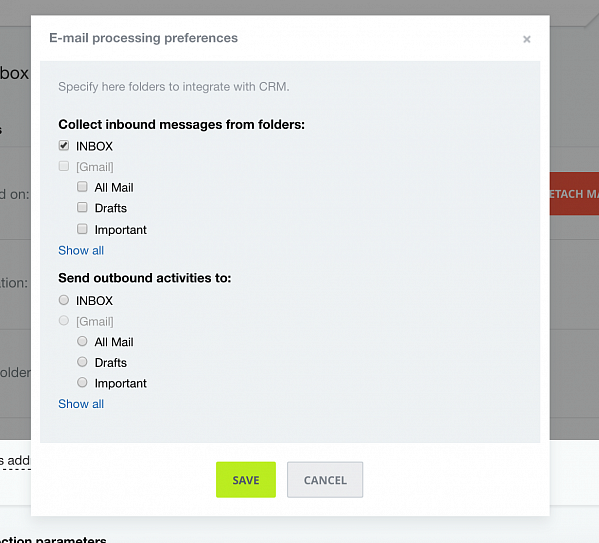 This option will let you choose the folders from which CRM will collect messages. The setting “collect inbound messages from folders” is self-explanatory and shows from which mailbox folders CRM will take your inbound messages. 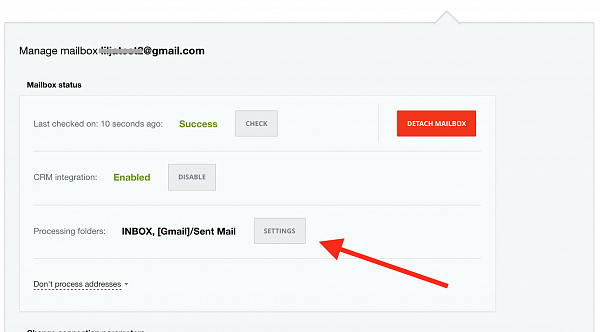 The setting “Send outbound activities to” enables you to choose from which folders your sent emails should be collected. IMPORTANT: Lead generation will work only if you activate “Create lead for unknown sender” option in your general settings of mailbox integration (CRM – Settings – Email – Email integration). Each employee should attach their mailbox on their own.